You know, the Moss Seasilk might have been a faulty skein after all! Remember how it didn’t have any discernable scent? Well, in contrast, every time I handled the Straw skein, I got an unmistakable ‘green tea ice cream’ aroma, reminiscent of the Tilli Tomas Pure and Simple silk I’ve used in the past. Mmm, mmm, delicious! 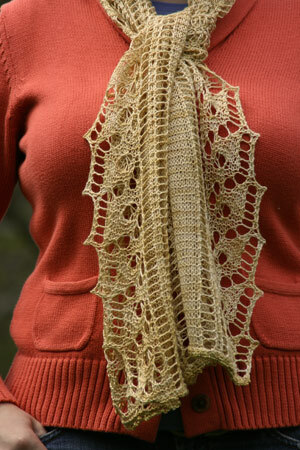 Pattern: Dolphin lace scarf from Victorian Lace Today by Jane Sowerby (review/preview here). Needles: Blunti Stumpos, US 4 (3.50 mm), F (3.75 mm) crochet hook. Yarn: HandMaiden Sea Silk in Straw, 1 skein (438 yards), used up almost in its entirety. Finished dimensions: approximately 13″ wide and 58″ long (28 repeats plus crocheted edging). 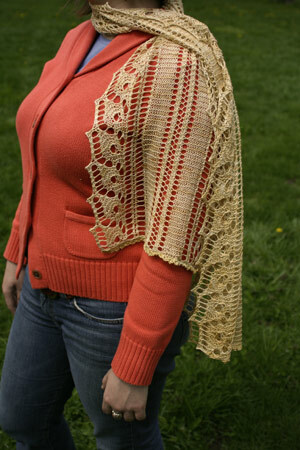 One skein of Seasilk does it again! A totally wearable scarf which doesn’t offend the budget? Check! What I love most about this pattern is that it really allowed me to squeeze every last stitch out of a limited amount of yarn. The lace is quite open, and knitting the scarf in one piece left the algebra ‘out of the equation’ :). As a result, the Dolphin scarf is even bigger than the Melon scarf! The pattern was easy enough to follow once the hiccups were chased away. And the splashing, dancing dolphins inspire even land bound animals to take flight. If I know where they are I can find the dolphins. So, how long did you have to stand in this position? Gorgeous! The more I hear about this sea silk the more I want to get some. It is so beautiful, those subtle color variations – perfect yarn for the project! lovely! Nice work – the yarn and construction are great, enjoy. That is absolutely gourgeous, great photos too. You definately did it again! That last picture is super-cute. We did a pose called “dolphin” at yoga yesterday–maybe you should give that a try while wearing the scarf? Gorgeous! And you are so adorable in that last shot! Beautiful! I’ve got one hank of Sea Silk left over, and I’m glad to see a picture of what could be done with it. Wow, that’s amazing! I love how airy and open this scarf is. It’s so beautiful! I love the sutble colour shifts in the yarn. It reminds me of iced Chai on a hot summer day. But great job on the scarf! It’s beautiful, and if something inspires you to strike silly poses, that makes it even better! Gorgeous — and very cool that you were able to use every last bit of yarn to maximize scarf size. It looks fantastic! Love the color – and the photo shoot looks like it was tons of fun! It’s beautiful. And I love that you can use one skein of the Handmaiden Silk for a functional, beautiful scarf. Great job! I love this scarf and how beautifully you made it. You are a constant inspiration to me. Thanks for prodding me to do better and do more! Gorgeous scarf!! Love the pictures too! Another beautiful scarf! It looks wonderful! I hope you get lots of use out of it! really pretty work. it looks like it has a little weight to it (which i like). and, you got a very healthy-sized scarf out of that single hank. nice! Beautiful! The simplicity of the centre panel really sets off the ornate edges well. It turned out gorgeous and obviously ended up with a lot of fun. I do hope that Ene will make you laugh as you do the photo-session to celebrate her completion? So pretty! I just bought that book, and I can’t wait to try out some of the patterns. WOW! It is gorgeous! And only one skein. Amazing! Great photos and a lovely scarf! That’s a lovely scarf. 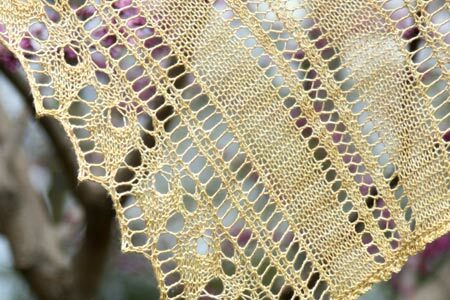 I have not really ever knitted lace, though I’m getting geared up to by way of a couple swatches. I have a question, to keep your points pointy and your holes holey do you periodically re-block lace or would it be sacreligious to starch it a bit to help keep its lovely crisp shape? Or is that dependant on the fabric? Great photos and darling scarf! Absolutely lovely! Which has been your favorite lace knit to date? It looks great! These posts of minimal-yardage scarves are really helpful for handspun too! Very beautiful! Well done, as always. What a beautiful scarf! I can’t wait to get my hands on that book. That is beautiful. I have a skein of seasilk that I take out and stroke/sniff occasionally and that I’m too scared to do anything with in case I ruin it! I may just have to turn it into dolphins. I just wanted you to know, you are a lace inspiration to me! 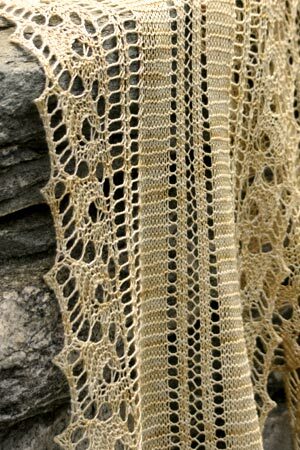 Gorgeous – a perfect pattern for that style and color of yarn. (Isn’t Handmaiden wonderful? You should give their lace silk a go – I can’t get enough of how awesome the colors are.) A lovely knit! So gorgeous….makes me want to cast on some lace RIGHT NOW! Very lovely! I bought that book for my sister for her birthday…a book that’s good enough for the ‘rina is good enough for my sister! now you’ll have to get Posiden socks (from the Tsock Tsarina) –they too have dancing dolphins–to make matching socks! Inspiring! And your stitches are so even! See how I wore it today at the park with Lily! Wow, that is amazing! Nice work! and what do you mean about it smelling, is it supposed to be scented, or does it naturally smell? Lovely work! It looks like a great spring scarf. Another gorgeous knit! It’s lovely. You are right about the smell, some skeins do smell and others don’t. I have Sea Silk on my “to get” list. Your shawl is gorgeous! I especially love the flight pose. You are a nut. A clever nut, but a nut just the same. Pretty scarf and the smell sounds really nice and bright. Very nice my dear! It almost makes me want to try lace again…almost…How’s that skirt? Done? Cute. I totally see the dolphins today. Yours looks way better than the one in the book. You’ve convinced me to knit it, actually 🙂 and that was the one pattern in the whole book that I really detested. Thanks!! !